What is the Loyalty Plugin? The Loyalty plugin is a great feature that allows your users to accumulate points and then redeem these points for specials and incentives that you offer. Unlike other “punch card” systems, our Loyalty Plugin works for any type of business because it allows you to set the promotions you want with an associated redemption point value that you feel is appropriate based on profit margin and availability. What are some use cases of Loyalty Plugin? Much like restaurants, retail businesses can use the loyalty feature to reward their customers for the same types of activities, only applied to retail products. What are the Loyalty Plugin’s primary functions and what are the steps to accomplish them? 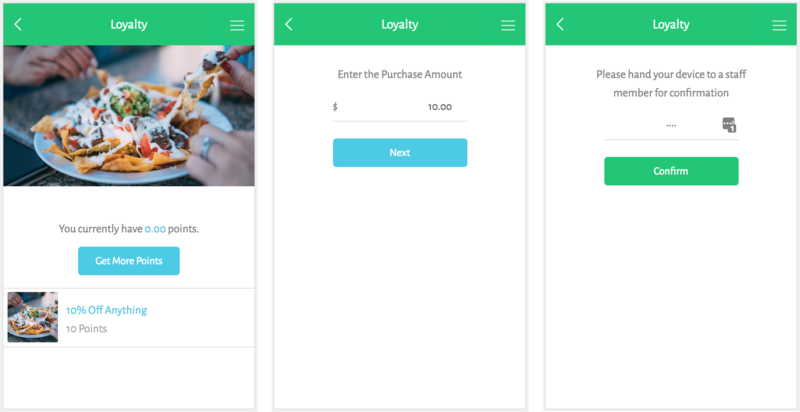 The Loyalty plugin provides some amazing functionality as described in the introduction, but read on to see what some of the core features are and how to set them up. Points per Purchase: Gives extra points for each transaction. Points per Dollar: Credits points for each dollar spent. Daily Limit: A limit on how many points people can accumulate per day. Add Points Passcode: This code will be entered by your employees or staff to verify the points should be applied to this user. Now that you have added your plugin to your app and set up the way for users to get points, it is time to add some rewards for users to claim. Click the ‘Add New Reward’ button to add a new item. Generally, this would be the item they receive by redeeming their points. One or more header images can add to the professional look of the app. For the Carousel images specifically, we recommend a 16:9 ratio. If the images is a different ratio the system will center image and have it fill the area, then it will cut off any 'overflow' to have it fit the area correctly. Step 4: Add the number of points required to redeem the reward. The Loyalty feature uses our built in user profiles and user data. This means that users will be prompted to login to the app to accumulate points if they are not already logged in. In addition to a loyalty program, your loyalty plugin will also act as a lead generator. This is because in order to accumulate points, your users will need to setup an account. Once they do, you will be able to export their data under User Management. You can use the WYSIWYG to embed images, video, and forms. This means that if you have a barcode or QR code that you would like users to scan to redeem the reward, you can add it in the item’s WYSIWYG. Check out the Using the Text / WYSIWYG Feature tutorial video to get more information and best practices.